What would you get if you crossed April1st with a monster? April Ghoul's Day! Ha, ha, groan, groan. April just happens to be National Humor Month. And, now....all joking aside...Welcome to the April edition of The Book Review Club! We've got terrific reviews of terrific books. Please scroll down after my post for links to everyone else's review. For whatever reason, I don't tend to read much nonfiction. But when I do, I enjoy it. And I really, really enjoyed this book. So, what is it about Sonia Sotomayor: A Biography that grabbed my attention? For starters, Sonia Sotomayor herself is incredible. I mean, come on, she's the first Latina and the third woman appointed to the US Supreme Court. She's your basic American icon! -At the age of eight, she began giving herself insulin shots. And we're talking back in the day when you had to sterilize the needles! -She grew up in a housing project in South Bronx. Her mother raised her and her brother on $5,000/yr. When her parents fought, Sonia escaped into books, homework and TV. She even read Encyclopedia Brttannica! She decided early on to become a police officer, then changed her goal to lawyer after reading this latter profession was more compatible with her diabetes. -As a Princeton undergrad, she joined organizations to help improve the conditions of various ethnic groups. She believed she was "...not a champion of lost causes, but of causes not yet won." Okay. So, Sonia Sotomayor is a great subject. What else makes this book sing? Details. This book is alive with details. It often reads more like a novel than a biography. Which is infinitely more appealing than a dry account of someone's accomplishments. For example: On Sat. nights, Sonia's extended Nuyorican (Puerto Ricans living in New York) family gathered for good food, music and games. "She wanted to hear every word as they chopped vegetables, talked, laughed, and exchanged gossip. Sonia pressed her ear against the kitchen door to hear. She wanted to be a part of that link of womanhood, of that link to her heritage, of that link to two worlds." The writing. Sylvia Mendoza writes well, really well. She's obviously done extensive research. (You should see the bibliography!) I was confident I was getting the real deal, the true story of Sonia Sotomayor. As an aside, I think the language is sophisticated enough to appeal to YA readers. The take-away. 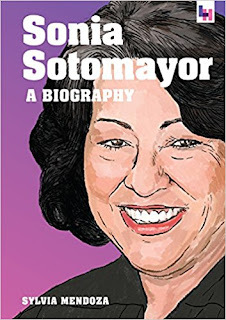 Sonia Sotomayor: A Biography is inspirational. It encourages you to be the best you can. To fight for the underdog, to care for your community, to honor your roots. "At the end of each day she asks herself two questions: What have you learned today? What acts of kindness did you perform?" Seems like an awesome way to live your life.